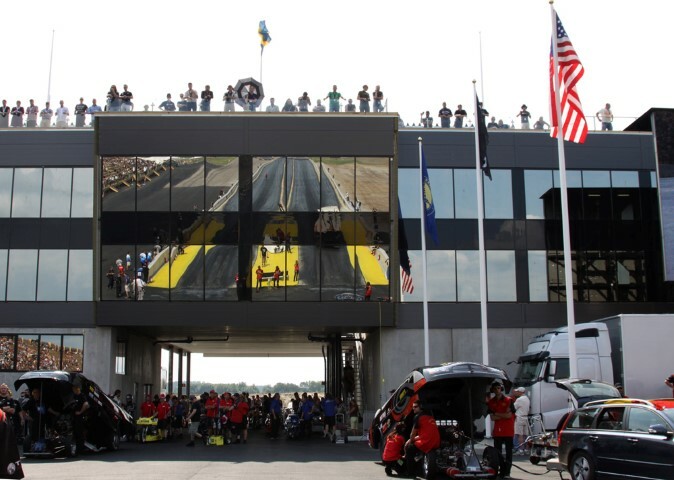 The second round of the FIA European Championship took place at the brand new track in Tierp, 100 km to the north of Stockholm. What an amazing place!! grandstands. On top of that we had 3 days of sunshine and very hot weather. On Friday morning we almost couldn't wait to get out on the track and finally after a few delays it was our turn. The first run was nice and straigth, no shake and a 5,90 sec. Good start of the weekend. And after two years of struggling with the chutes they finally came out perfectly. Such a safe feeling knowing the chutes are working. On the second run Danny hit shake, the car moved to the concrete wall and he had to go of the gas. After the race on Friday evening a friend of ours (thanks Erwin) informed us about the quality issues with the Hoosier 36 inch tires, which made us decide to go back to the 34 inch tires. There goes our setup. centerline so Danny had to pedal and finished with a time of 6,4 sec., Leif 5,78 sec. and was the winner. Racing was over for us. Maybe the weekend could have been different if we could have stayed with the 36 inch tires, but we certainly want to come back to this great track. Next stop will be Hockenheim, Germany in august. Next weekend Sandro will be taking out his Bel Air to Drachten, Netherlands. Many thanks to our sponsors Rico Tools, Marcover, Iso-Mobil, Speedshop Belgium, Danny Cars and De Klussenier, Nico Van Uytven.